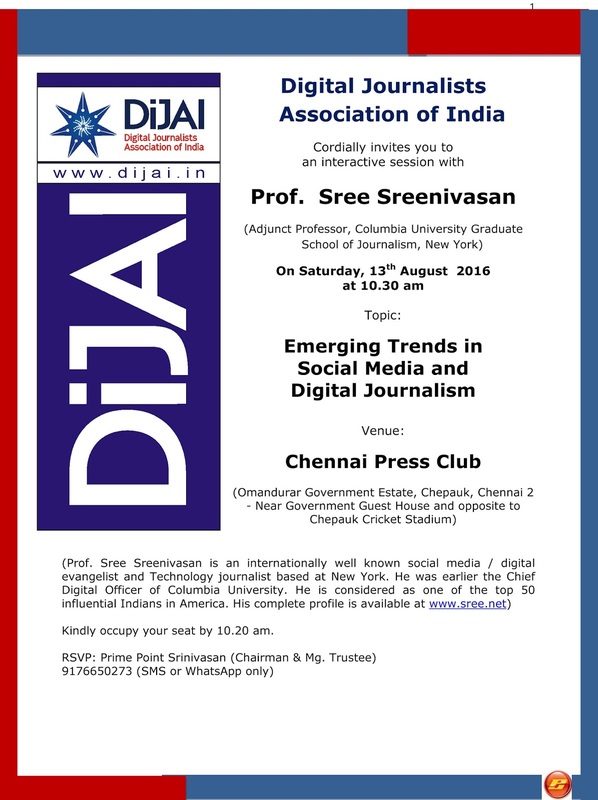 Digital Journalists Association of India (DiJAI) organises an interactive session with Sree Sreenivasan,(internationally well known social media and digital evangelist and Technology Journalist based at New York) on Saturday, 13th August 2016 at 10.30 am at Chennai Press Club. Working journalists and digital journalists may participate. Since the seats are limited, please confirm participation through SMS or WhatsApp to Prime Point Srinivasan over 9176650273. No participation fee. Only confirmation is needed. Please also share this information for the benefit of all journalism students and working journalists. You may also kindly share with journalism faculty members of other colleges.